Soft flowing lines and features for a coastal, small parkland garden. This very large 1930s coastal property is on the scale of a small parkland. 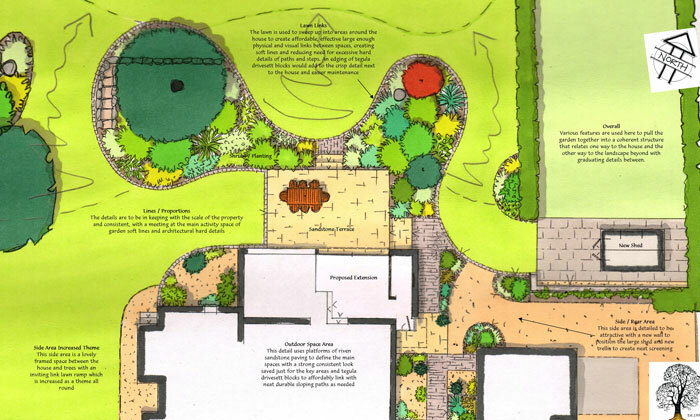 The client needed a complete master plan produced to create a sensitive and coherent design incorporating some existing features and assets whilst removing many old and failed detractive elements. The client was also having a very large modern extension added with great views over the garden and wanted outdoor spaces that blended well with an overall garden design and character that they liked. Once I identified a character they liked, that worked well for the property, I developed the master plan in great detail, incorporating many existing mature features. The end result was a very attractive design that graduated away from the modern extension and associated outdoor rooms into an ever softening parkland garden with great internal views and superb framed views out to the coastal landscape beyond. The client was delighted with the blend of features that brought together new and old to suit their budget. They were also delighted with the level of detail produced that allowed them to phase the work over the coming years with clarity about how to proceed.